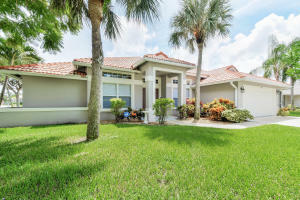 1043 Egret N Circle Jupiter, Fl 33458 has been sold. RENOVATED AND PRISTINE! FABULOUS 4 BEDROOM LOCATED IN THE SOUGHT AFTER COMMUNITY OF EGRET LANDING. THIS SPECTACULAR ONE STORY HOME IS LOCATED ON A CORNER LOT AND HAS BEEN UPGRADED IN EVERY ASPECT, INCLUDING A BRAND NEW FRONT DOOR, NEWER PAINT, WOOD TILE IN ALL MAIN AREAS, OPEN KITCHEN WITH GRANITE/NEWER STAINLESS STEEL APPLIANCES AND TRENDY SHIPLAP AT COUNTER, CATHEDRAL CEILINGS IN THE LIVING AREA, RENOVATED MASTER AND GUEST BATHS WITH QUARTZ/MARBLE, ADDED CROWN MOLDINGS, SCREENED IN PATIO, AND HURRICANE COVERING FOR ALL WINDOW OPENINGS. THE FOURTH BEDROOM IS ADORNED WITH FRENCH DOORS AND GORGEOUS BUILT IN SHELVING, PERFECT FOR AN OFFICE OR GUEST SPACE. 1043 Egret N Circle located in Jupiter, FL is a single family home with 4 bedrooms, 2 full baths and 0 half baths.The Home at 1043 Egret N Circle was built in 1995 in Egret Landing and offers a 2 car garage. This Egret Landing Home offers pool, tennis, bike - jog, clubhouse, basketball, exercise room, community room, library, picnic area, sidewalk, street lights. 1043 Egret N Circle Jupiter, Fl is currently listed for $489,000 under the MLS# RX-10462911. This Home has been put on the Jupiter MLS system and currently has a status of SLD.